Happy Monday, Friends! I hope you had a good weekend. My little family took some time off during the weekend, and had fun exploring the city. I have been meaning to share the following with you… I like to hand sew my binding to the quilt back after it is attached onto the quilt by machine. I recently found myself liking the Aurifil Mako 28 cotton threads (gray spools) for hand sewing my quilting binding. The weight is heavier, but not so heavy that I feel like I am sewing with a piece of rope. In my estimation, the 28-wt thread handles perfectly for the purpose of hand finishing my quilt binding. 1. Do you hand sew your quilt binding onto the quilt back? 2. 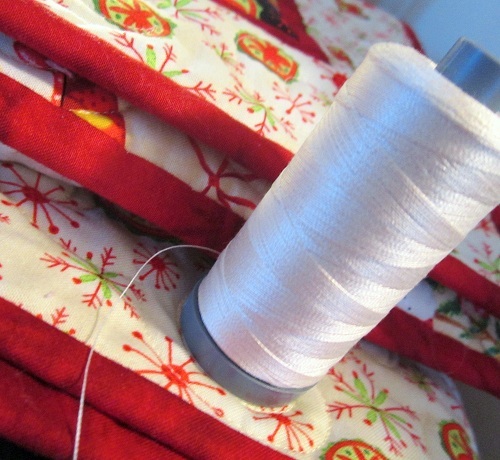 Do you have a favorite thread for hand sewing your quilt binding onto the quilt back? Thanks for stopping by. I hope a lovely week awaits you — meanwhile, I will be working away. I do hope to take additional pictures of some recently featured projects that have been returned to me. Stay tuned. This entry was posted in Quilting and tagged Aurifil Mako 28 Cotton, Hand Sewing Quilt Binding. Bookmark the permalink. I have tried various ways of machine sewing the second run of the binding and I will use that for heavy use ones only because I have had thread (Gütermann 50 weight cotton) break and the binding come open so repair has been necessary. I like your idea of using a heavier thread and will see if I can find the 28 weight Aurifil anywhere in my part of the world. When I do sew both runs on the machine I attach thebinding to the back first and sew it down on the front. Thanks for sharing. I always hand stitch the binding. I haven’t found a way of doing it neatly on the machine. I have never thought of special threads.. I just use ordinary sewing thread. Whatever I happen to have! is that very naughty? 50 wt thread, polyester, sometimes 60wt. Don’t want those stitches to show! I machine-sew the binding to the front, then hand-sew the binding to the back. I use regular cotton/polyester thread, and “tie” each stitch so that the thread doesn’t show. yes I always sew mine by hand on the back. I use a cotton thread. It’s YLI soft touch 100% long staple cotton 30/2 ply in color to match the binding. So far, so good. I always hand sew the binding to the back of the quilt–even charity quilts for babies born at the charity hospital. I usually use DMC 50 wt thread that I use for applique. However, I like your idea of using the 28 wt thread especially since these quilts will get lots of use. I’m binding 2 quilts today and will shop for thread this morning. Thanks for the tip. After stitching binding to the front by machine, I hand stitch the back, generally using hand quilting thread. Tried both the 50 and 40 wt Aurifil and it seemed to tangle a lot, no matter which end I knotted. Will have to experiment with the 28 wt. I like using Coats & Clark hand quilting thread because it isn’t too heavy or noticeable, yet is strong and doesn’t seem to tangle very much unless I knot the wrong end! Yes, I hand sew my binding to the back of the quilt. I use hand quilting thread to do that. It’s sturdier, less likely to knot or break. Yes! I do hand sew my binding down on the back. I like the look and feel of it. Even on the baby quilts that get washed repeatedly. I like to use the glazed hand quilting thread for the heaviness and sturdiness. If I don’t have a glazed spool, I bees wax my unglazed quilting thread for durability during sewing. I enjoy sitting and hand sewing my binding on as well. I will have to give the Aurifil 28wt. a try as I tend to use the same weight that I use when piecing. I always handstitch the backside of my binding because I think it gives a nice finished look. I use Mettler thread for hand sewing but I’m not happy with it because it seems to tangle too easily. I’m definitely going to try the 28 wt Aurifil thread you suggested. Thanks! Binding is my least favorite thing to do, so I have tried to sew it by machine. Sometimes with a decorative stitch. But the quilt always looks best when I hand stitch the binding. I use whatever thread I have been sewing and quilting with. Yes, I hand sew the binding on the back. It does not turn out that nice when I try it on the machine and I do not mind the handwork. (The best part is trimming the batting etc off before attaching the binding. Isn’t it?) I use regular cotton thread or a blend if I need a certain color. I always hand stitch my binding to the back of the quilt. I use Mettler 40/3 threads. I have a good supply of it as it used to be my go-to thread for piecing until I discovered Auriful 50/2 for piecing. I like a finer thread for piecing and a bit stronger thread for the binding hand stitching. I will look for the Auriful Mako 28 cotton thread when I go to IQF in a couple of weeks. Yes, I hand quilt the binding on the back of my quilt and I use the Coats and Clark Hand Quilting Thread. I guess I am cheapO on my thread mainly because I don’t know enough about thread wts. to experiment. We had a great weekend,too. We went to Santa Fe for 2 nights and love the rain while we were there. Even sat out under the table Umbrellas while eating lunch. So peaceful. Remember we have just had about 1 inch of rain since January in Southern NM. Have a great week. That is a good tip! I hand sew everything except bindings on charity and/or kid’s quilts using hand quilting thread. It’s nice and strong with very few knotting issues! 1. I always hand stitch the binding to the backs of my quilts. 2. I usually use a 50/3 Gutterman or Mettler cotton thread, but when I finished my last quilt I accidentally grabbed a spool of 60/2 cotton embroidery thread. I had half of the binding stitched down on that bed-sized quilt before I realized my mistake, and although I switched thread at that point, I decided NOT to redo the portion I had already stitched down — because the quilt was going on my own son’s bed, and I decided I could just as easily restitch the binding later when it inevitably started coming loose. Lazy Rebecca! For heirloom quilts and display quilts I will machine and then finish with hand sewing. With Heavily used bed quilts and childrens quilts I machine apply the binding. Regarding thread, whatever quality thread is at hand that matches the binding. For “good” quilts, I hand sew the binding to the quilt back using Bottom Line thread from Superior, ever since Bonnie Hunter suggested it. I used to hate hand sewing bindings, but over time I’m gradually learning to enjoy it as a way to say goodbye to the quilt, as one of my quilting friends once gracefully phrased it. Thanks always for the blog! Sarah, is this a good way to finish baby quilts? I saw the dvd and wondered if it was more trouble than it’s worth. I usually hand stitch but would like another alternative sometimes, like for art quilts. I have a lot of sewing experience but sometimes these “shortcut” techniques are so fussy you might as well do it by hand. I do sew my bindings by hand to the back, but I don’t have a specific thread I use. Usually it is whatever I used to quilt it with or whatever matches the best. Usually use hand quilting thread. Machine sewed it only once – you can only guess why I returned to hand sewing! Will definitely investigate the ‘sew fast’ method suggested by Sarah and will also try the thread you mentioned. Thanks for a GREAT blog! Yes, I hand sew my binding onto the back. I am doing that right now. I have no favorite just the right color. I know some works better than other but forgot what brand. Yep. I always hand sew down my binding. I’ve used Aurifil #28 weight for that, for at least the past seven years. It’s great stuff! I have experimented with it both ways but hand finishing is the best looking, no doubt. I love Superior Threads Bottom Line thread. I even use it in the bobbin of my long arm. It’s thin and really strong.